When emailing became the most convenient means of communication in the early 2000s, it did not take too long for it to be integrated with other business functions such as graphic design, information technology, and marketing. Similar to social media these days, emailing is just not about basic conversations anymore through the simple sending and receiving of messages. You may also see Sample Email Signature. 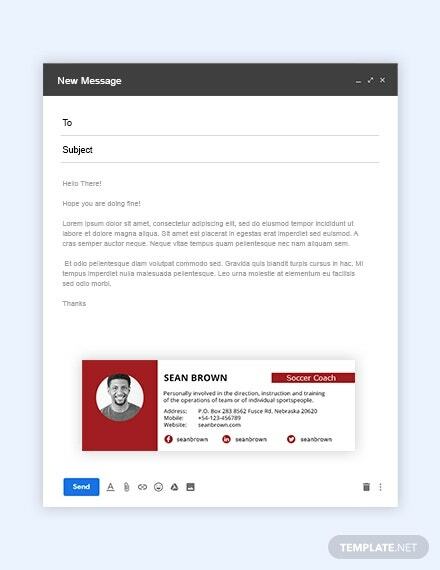 Businesses have used email as a means of marketing as well, which has led to the introduction of highly customized and personalized email signatures. A few years back, email signatures were simply a two or three layer block of text which listed the individual or company’s name, email address, contact number, and business. Fast forward to today, email signatures still contain these pieces of vital information but have evolved in terms of looks and functions. 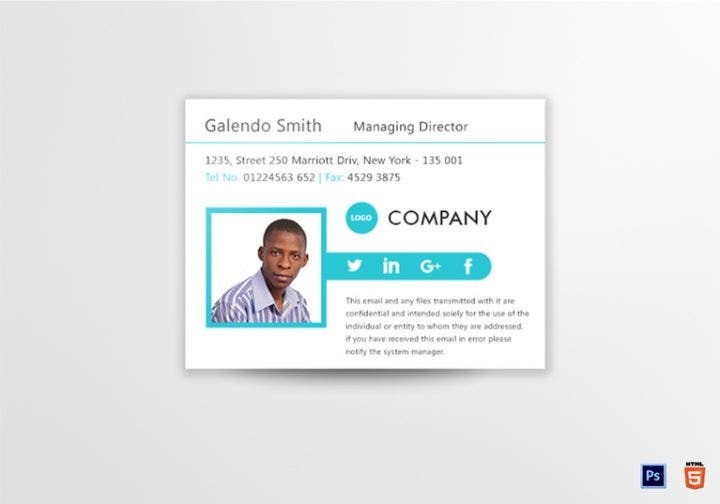 Free email signatures are now designed similar to posters and other print media materials which use the most dynamic graphic design software such as Adobe Photoshop and Adobe Illustrator. Additionally, email signatures are now capable of being linked to the individual’s website and other online portfolios. Sports has also evolved in the 21st century. Different sports have become a business which rake in incredible profits thanks to a combination of super athletes and sports organizations having numerous tie-ups with clothing, shoes, and sports drink brands. If you are involved in the sports business (finding sponsors, scouting players, selling sports merchandise, etc. ), then these email signatures will come in handy for you. Here is the sports email signature template you should purchase before purchasing any other email signature template. 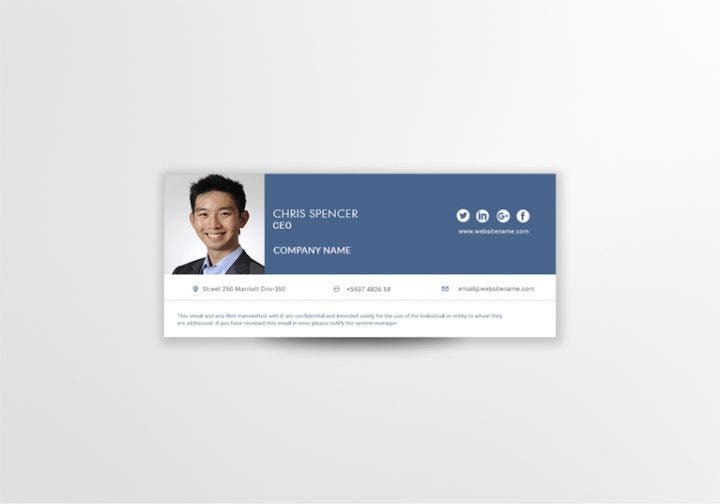 This template is fully customizable, allowing you to edit the layouts and graphic files. Standard fonts are included as well as the images seen in the sample template image. This template uses a Photoshop and HTML format and has a 792 by 272-pixel file size. 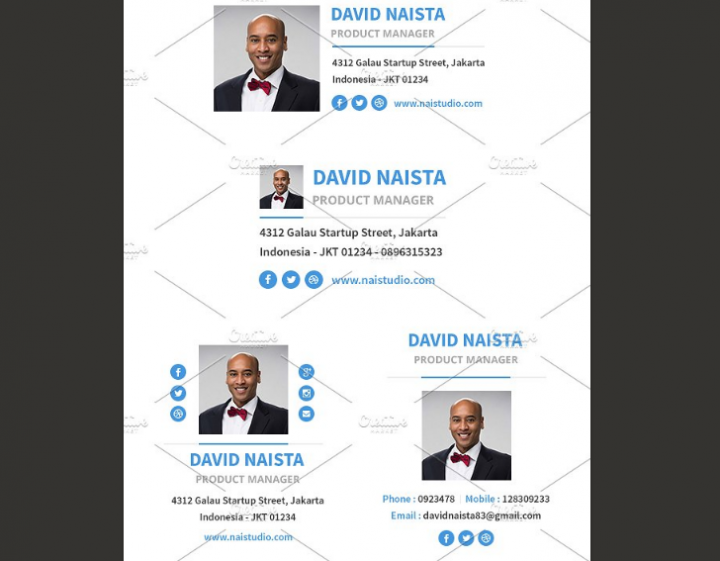 If you are using Microsoft Outlook, then this multipurpose email signature is great for you. 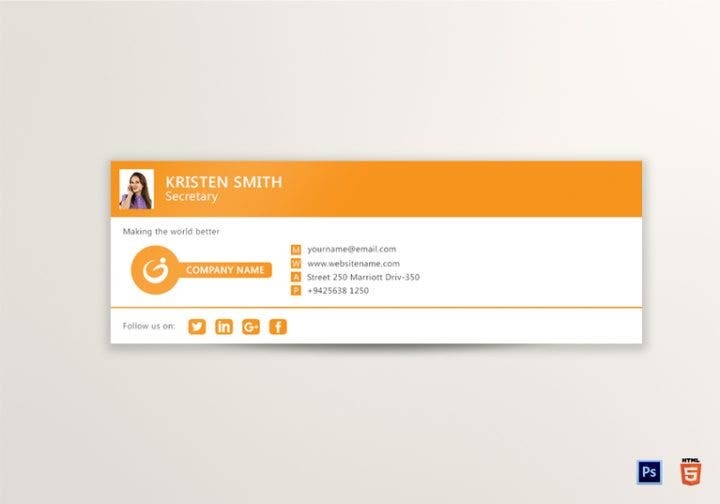 Yellow is used as the dominant color for this email signature template which radiates a brightness that is cheerful yet still looks professional. 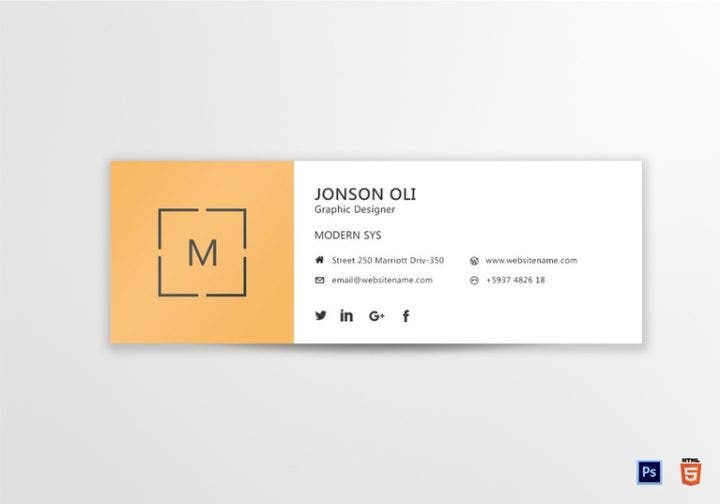 As stated in the name of this email signature template, this email signature uses a more modern and flat design which can be seen in most graphic designs nowadays. 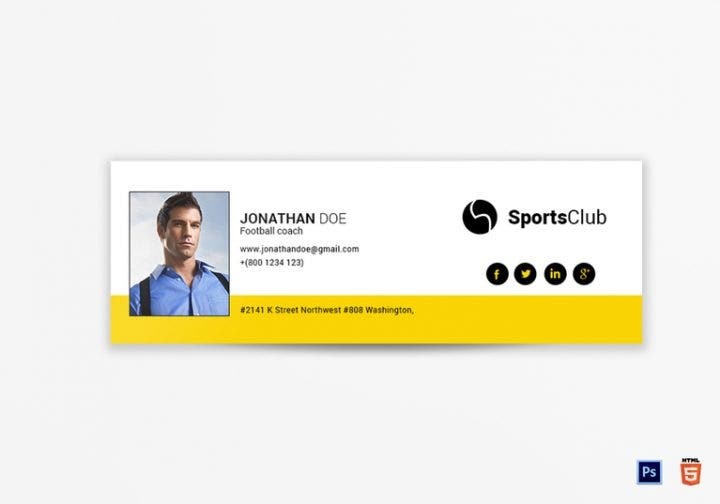 This CEO email signature template has a formal and minimalist design, making it suitable for use a sports email signature template. Your photo is adjusted to have a bigger size while your name, designation, and social media links are listed on the blue-colored background. Similar to other templates, this template is fully customizable with editable layouts and graphic files. Fonts are included and RGB color spaces are used. This is a multipurpose email signature template that uses some nice red colors complemented with a white background. Similar to the other templates, this design is fully customizable. 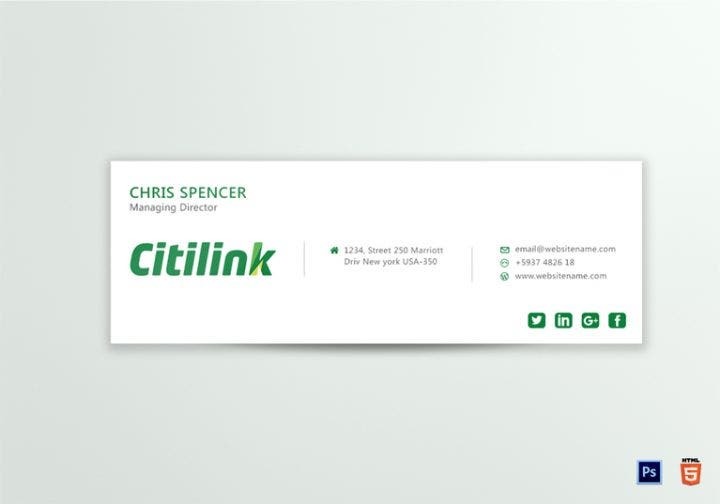 This email signature template has a flat and minimalist design that uses a white-colored background and green-colored text. This template is also fully customizable together with the other templates. If you are doing human relations work for a sports company, then this HR email template is a great option for you to purchase. The photo has a different layout compared to the other templates, as the half-body is used compared to a smaller size in other templates in which the face is only shown. Make sure to dress up well when you use this email signature template. This bundle contains 70 PSD files with each template having a 400 by 300 pixel size. Seven colors are available for this bundle (blue, red, purple, green, orange, teal, and black). This email signature bundle has a nice collection of templates you can use for different email conversations. This bundle contains free icons, multiple styles in two colors, two PSD files, 20 HTML files, and RGB colors. This template also uses a flat and modern style. 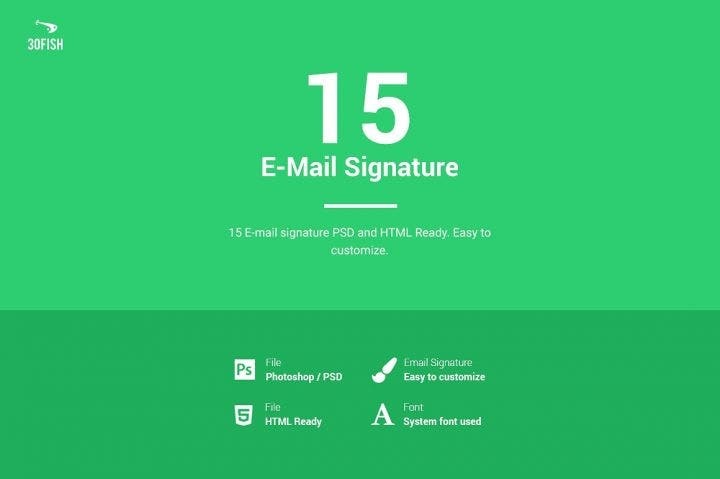 This email signature bundle contains 15 email signature designs which are very attractive and can easily grab the attention of your clients. These signatures are HTML-ready and easy to customize. 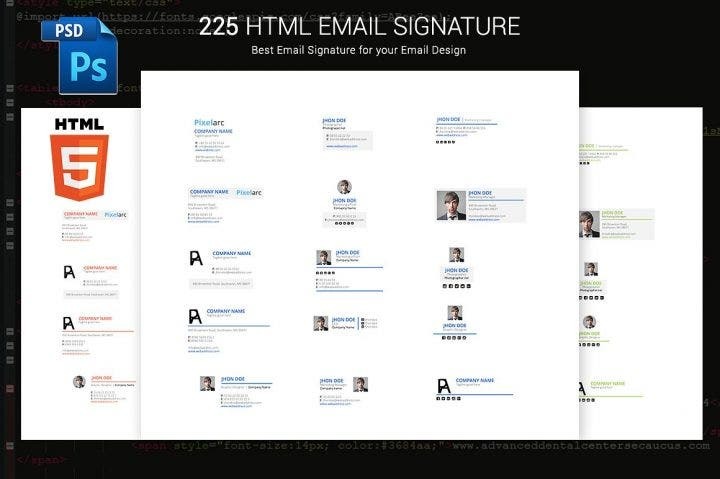 This 225 email signatures bundle has an extensive collection of email signatures that you can use the whole year round. Change up your email signature designs with these fully customizable email signature templates. This email signature template bundle contains 10 email signatures that are fully editable and customizable. These email signatures are fully editable and you can choose any template for the next email conversation with a client. 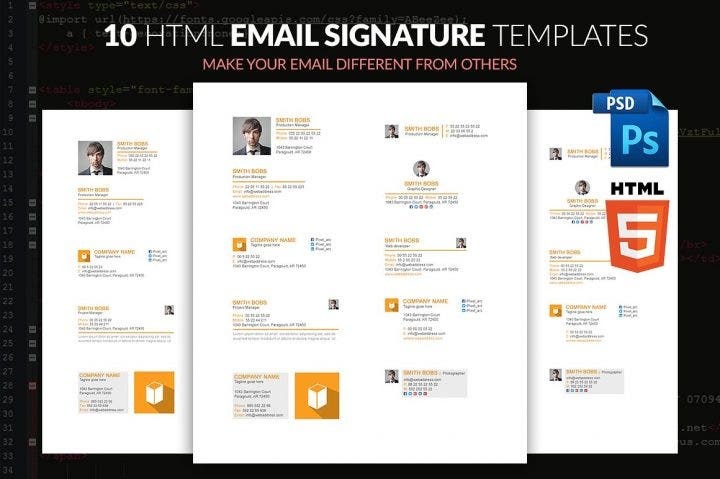 This 22 email signatures bundle with a builder contains 22 email signature templates that you can use and change any time as you deem fit. You can also share these email signatures with your colleagues. Here is a multipurpose email signature template you can use for any event or email transaction. The blue and white combinations complement each other together with the formal font style. This template is also fully customizable with editable layouts and graphic files. We highly suggest that you purchase the sports email signatures listed above. They will both save you time and money. But before you make any purchase order, read these tips first. They do not only apply to sports email signatures alone, but to email signatures in general. 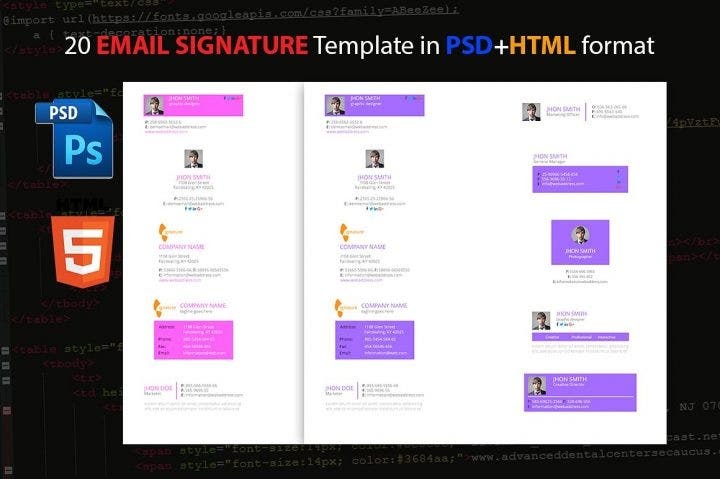 Email signatures are not business cards where you can just hand them out like flyers. They are only seen in email conversations and are mostly located at the bottom of the email. 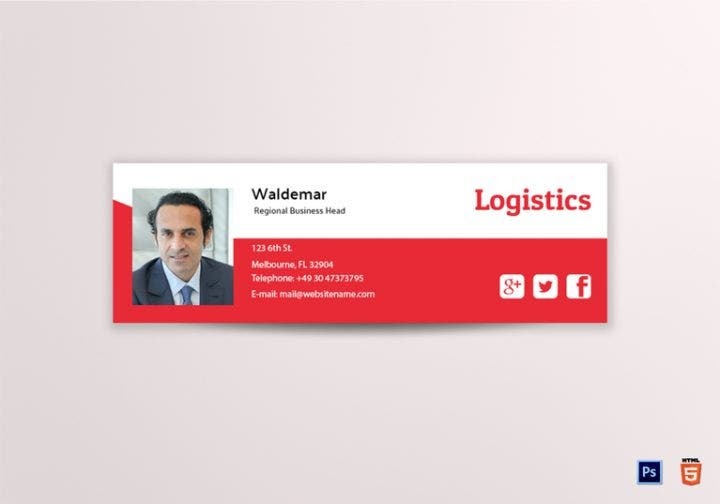 But similar to free business cards, they are small in size and only require a little effort to make them look attractive. That being said, there is no reason for you to overspend for email signatures. Even if email signatures are effective marketing tools and you plan to make them look stylish, do not dig deep into your pockets and use that money instead for other purposes in your business operations. The ideal price for email signatures which are mostly sold in packs and bundles should be below $10. As previously mentioned, email signatures are mostly sold in bundles or packs. These bundles contain numerous email signature designs, free fonts, design software compatibility, and a help file to make it easier for you to make your own personalized email signature. Although there are numerous email signatures with a single design being sold at an affordable price, you can purchase bundles that offer more designs for the same price or even probably less. If you want to be sure that you are getting quality email signature templates which will give you great value for your money, then purchase from online graphic design shops that contain an extensive number of templates for various purposes (for a number of events and occasions). 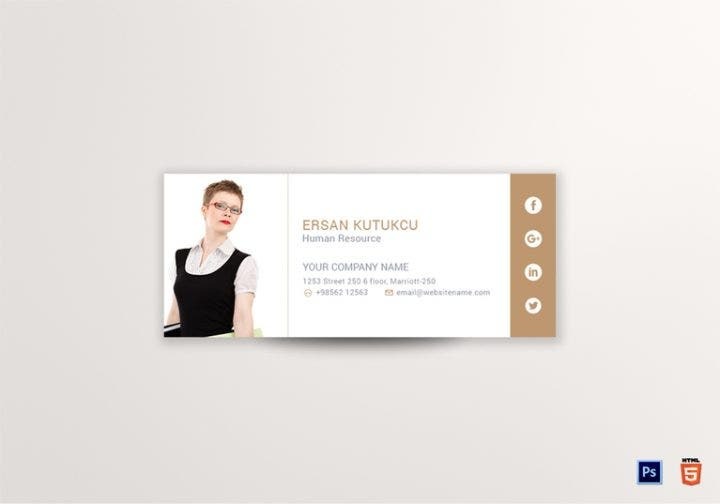 These online shops do not only sell email signature templates, but also other templates such as posters, business cards, flyers, menus, and invitations. Email signatures are mostly used by professionals to interact with people within their company and other stakeholders outside the company like clients or customers, government personnel, academic institutions, and environmental or social groups. 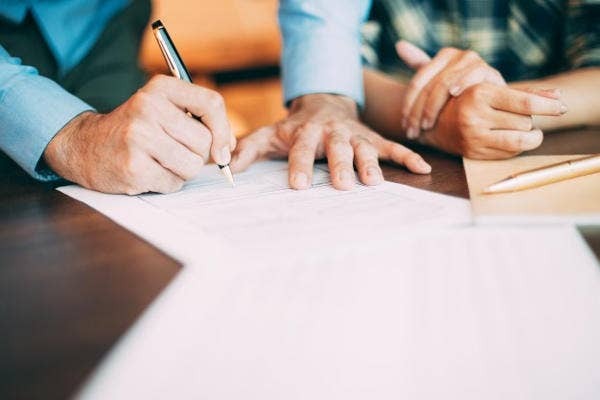 If your company already has an email signature template that is used throughout the organization, then it may be hard for you to use your own email signature which you already purchased or are still planning to buy. But asking questions never killed anyone, so you might as well ask permission from your direct supervisor or manager if he can allow you to use your own email signature. If you are an entrepreneur or self-employed, then you have the freedom to use your own email signature template. Just make sure to keep it simple and use flat or minimalist website designs to avoid any problems with clients who might not like bold colors and designs. Purchase these email signature templates now if you are in the sports business world and make an impression on both your colleagues and clients.